What a circus! On Monday, July 6, Mom and I decided to pick up a pizza for Dad on our way home from our day out. He's loved Bristol House of Pizza for years, and was very happy to see that we'd brought him his favorite - a small house special ($10.50 - 11.35 with tax). Since Mom and I still had a few errands to run, we gave the pizza to him and continued on our way. Only later did we realize that we had not taken a picture of the pizza, and when we returned home, saw the empty box in the trash. Yikes! Needless to say, I was furious at myself for not having taken a picture, so I decided to recreate the pizza event two days later. I pulled into one of the few spots in front of Bristol House of Pizza at around 4:30 p.m. When we were there on Monday, Mom and I had noticed that the pizza parlor had been remodeled. The long cafeteria-like tables had been replaced with smaller tables and chairs made of a dark wood, and the booth area - which had a tricky step that I always made sure I didn't fall over - was replaced by booths that were on the same level as the tables. There are also a few scattered tables just outside of the restaurant. 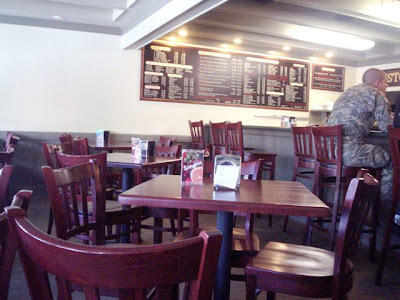 The large menu on the wall had been updated, and the bar area had been painted and lined with wooden bar stools. It is a classier look, but I'm sure no one really visits Bristol House of Pizza for the decor - they come for the delicious food. 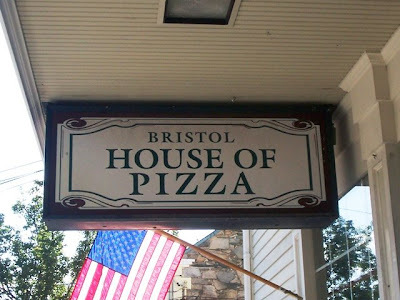 Bristol House of Pizza has one of the best - if not the best - cheese pizzas that Mom and I have ever had. When we visit, we usually get a large, extra cheese pie ($11.50), two cans of soda ($1 each), and an order of shoestring fries ($3). Where else can you get a meal like that for under $20? The prices are amazing, and the food is to die for. Some items include the Greek pizza ($10.50-15.50), grilled chicken pita ($6.75), spinach pie ($2.95), pasta with chourico ($7.50-8), four piece chicken dinner ($8), "Kapama" - Greek pasta - served on Friday, Saturday, and Sunday ($9.50), calzones ($6.75-8.75), stromboli ($11.95-15.95), appetizers ($1.50-7.50), and a children's menu ($2.50-5.99). They also serve wine and beer. As you can see, this is definitely the place to visit if you're on a budget, or if you simply want to taste some of the best pizzas and subs that Bristol has to offer. Since I was there getting a replacement pizza for Dad (the house special - $10.50), I also got something for Mom and I to have. 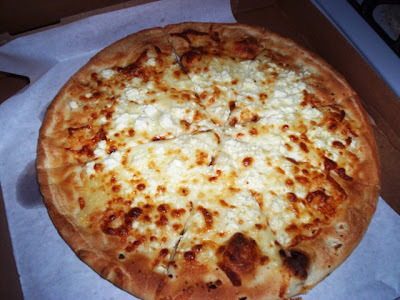 I chose a large white pizza ($14) which has no sauce and is made from cheddar, mozzarella, and feta. My total came to $27 with tax. While I was waiting for my pizzas to be cooked, I went across the street to Jesse James Antiques. It is a quaint little antique store that sells a lot of furniture, paintings, and ceramics. Plus, there is an adorable little Lhasa Apso named Lillie that has the run of the place. 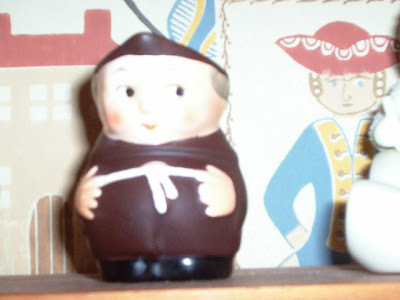 As luck would have it, I ended up finding something for my collection - a Goebel Friar Tuck figurine! I quickly busted out the checkbook while chatting with the two owners about more local restaurants that I have to try - and some that I should stay away from. They were great, and I believe that was the first time that I openly admitted to someone that I was one half of New England Bites! After all, we like to remain anonymous. The new Friar seems to be intimidated by our ominous wallpaper. Armed with my new Friar, I went back across the street to pick up my pizzas, which were waiting for me on top of the large metal pizza oven. The service at Bristol House of Pizza is always fast, accurate, and pleasant. We've never had a problem, and we've been coming here for years. After being caught in traffic for a bit (thanks, Braga Bridge), I got the pizzas home. Mom threw them into the oven for a few minutes just to warm them back up. Dad was a bit surprised to be having the same pizza again - only days apart - but he didn't complain. 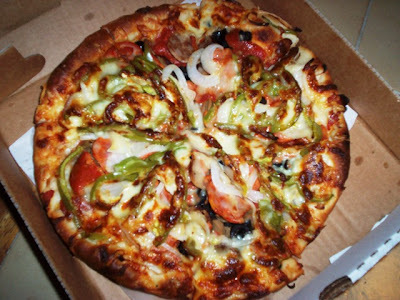 The house special is topped with hamburg, mushrooms, olives, sausage, pepperoni, chourico, salami, onions, peppers, and cheese. Geez, I got a hand cramp just typing all of those ingredients! Dad likes that, because the pizza is covered with so much stuff, they have to put a layer of cheese both on the crust and over the toppings to contain everything so that each slice is neat to eat. Dad said that this pizza is as good now as he remembered it from years ago. It is still one of his favorites after all these years. Mom and I had never had Bristol House of Pizza's version of a white pie, so we were excited to try it. We both thought that it was very tasty due to the blend of three different cheeses. The feta gave the pizza a nice tang that you don't often get with just regular mozzarella. Mom is slowly beginning to add feta cheese to her list of acceptable toppings, so I'm very pleased that this pizza didn't disappoint. The crust was thick, crisp, and had a nice homemade flavor. Even after traveling from Bristol to Fall River, everything was still in perfect condition. All three of us can see why Bristol House of Pizza has been a staple in the town for over 30 years. 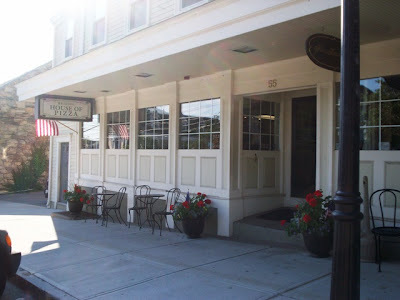 It is family-owned, family-operated, and the food is made with care and love. Everyone I know who has been to Bristol House of Pizza has left satisfied, and I'm sure that they'll be around for many years to come. We only wish that it was located a little closer to Fall River so that we could take advantage of the delivery service! Bristol House of Pizza is open during the summer from 11 a.m. to 10 p.m. Monday through Thursday, 11 a.m. to 11 p.m. on Friday, 11 a.m. to 10 p.m. on Saturday, and 12-9 p.m. on Sunday. During the winter, the hours change to 11 a.m. to 9 p.m. Monday through Thursday.